1. Begin with a solid telephonic and email research. Contact a couple of teachers. Do not only look for those based in your own area, the perfect teacher for you might be a couple of miles further. In regards to tuition fees, it is to be expected that a better teacher will ask a higher fee, but this is not always the case. The tutor's musical background should NOT be neglected. It is crucial to develop the right habits from the beginning as it is difficult to change them later. Even if you just play for the pleasure, learning the correct technique will increase your pleasure of making music. 2. When contacting the teacher, explain to him/her who you are and what you wish to achieve with music. This will create an initial conversation and you will get a general feeling of the teacher. To study with someone you appreciate is one of the most important criterias. 3. If everything seems good for you at this stage, make an appointment with the first teacher that you are comfortable with. During the first lesson, he or she should discuss your musical interests and wishes with you. The teacher should genuinely care for you and be ready to adapt his or her way of teaching in accordance to your needs and personality. 4. It would be highly recommended to ask the teacher some questions about his/her taste of music. It is always better to have common points with the person with who you will share your passion. 5. If you decide to continue with this teacher, you should make sure that you learn something in every lesson and that you finish the session with motivation! A good teacher will be able to give you the right amount of work, during and between the lessons, in relation with your level and the time that you've got available for your studies. If these guidelines are respected, you should find a good teacher and really enjoy your music making. The most important consideration is that you are happy to go to your lessons and that you feel encouraged and motivated. This will definitely help you in your musical progess. Even if you have to leave your perfect teacher for a reason or another, the enjoyment of discovering and studying music with him or her will stay with you for ever. Celine Gaurier-Joubert is a virtuoso concert pianist, business woman and creative genuis. She has a direct relation with Franz Liszt, having studied with a student of a student of the Maestro. Her magnificent knowledge of the piano, especially in regards to the perfect touch, sound and understanding of piano is evident throughout her performances. The London Piano Institute is the PERFECT PLACE FOR YOU to learn how to play the piano. It does not matter if you are an absolute beginner, intermediate or advanced piano learner. 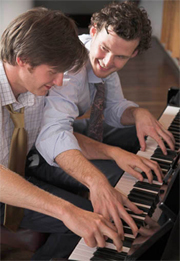 At the London Piano Institute YOU will learn the style and techniques that you've always dreamed about! Page text © 2006 London Music Teachers/Find A Teacher.